Located an hour from the bright lights of busy Manhattan, Grand Cascades Lodge is tucked away in the Kittatinny Mountains, in northern New Jersey's verdant Vernon Valley. Designed as an abstract of the resort's woodsy and earthy ambiance, the opulent Reflections Spa adds a touch of glamour to the rustic resort and has created what it calls a sanctuary for the senses, with striking architecture, exclusive spa treatments, and a spacious Sensorial Area with pool and waterfall. An elegant crystal ceiling marks the spa's entranceway, and tranquil water fixtures greet guests throughout each corridor. The extensive spa menu offers exclusive facial and body treatments, some of which incorporate elements indigenous to the area. 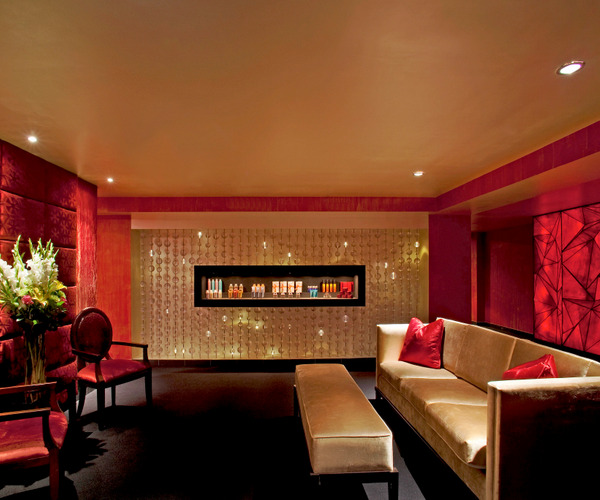 Reflections Spa is bathed in amber and burgundy hues, accented by vibrant art glass and custom waterfalls designed to resemble fire; sleek black-tiled floors enhance the elegantly modern interiors and add a sophisticated feel. Guests can indulge in unique treatments such as the Thai yoga massage; other treatments are inspired by the resort itself, such as the "The Wine Cellar" services, which incorporate wine and grape-seed extracts, and "Reflective Surroundings," which makes use of the area's local ingredients. Men can take advantage of the Gentlemen's Corner and unwind with a facial, massage, haircut, shave, or manicure. Brides-to-be have the option of reserving the stylish Bridal Suite, with manicure and pedicure, makeup, and hair styling stations. Guests can complete their spa experience with a visit to the Sensorial Area for heated salt baths and pampering foot soaks. Reflections Spa is part of Crystal Springs Resort & Mountain Creek and the Resort is known for its world-class amenities and activities including: seven award-winning golf courses, three hotel properties, 135,000+ bottle wine cellar, sister spa at Minerals Hotel, Elements Spa, twelve restaurants, summer waterpark and bike park and winter ski resort as well as snowtubing, all season Mountain Coaster, Soaring Eagle and Zipline tours. Other recreational options at Crystal Springs include those offered at Minerals Sports Club, a state-of-the-art sports complex with seven indoor and heated outdoor pools, a 6,000-square-foot fitness center, tennis and racquetball courts, a Pilates studio, and more than 80+ weekly fitness classes. Families, couples, business travelers, corporate groups, and outdoor enthusiasts will love this northern New Jersey resort. Grand Cascades houses 250 guestrooms, ranging from Premium rooms to two-bedrooms suites, with most featuring balconies with scenic views. All have high-speed Internet access and flat-screen TVs. Room interiors are inspired by the forest landscape and surrounding mountains, with wood furnishings, natural stone fireplaces, and dark green color palettes. Some rooms feature full kitchens with laundry facilities, living and dining areas, and decks with outdoor fireplaces. 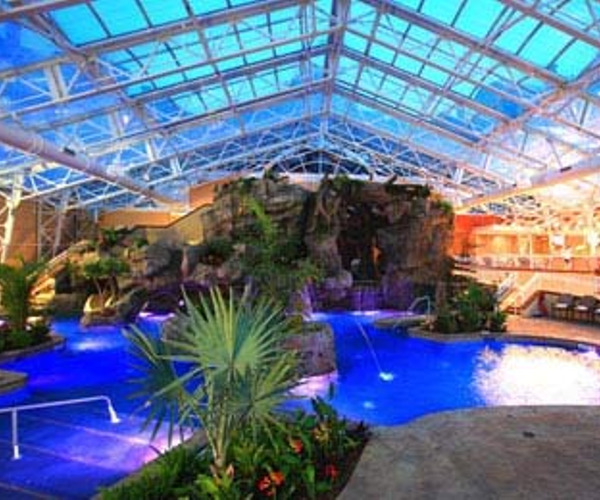 An additional 175 guestrooms are available at the resort's Minerals Hotel. Guests can dine on classic American cuisine at the resort's four-star Restaurant Latour, pairing meals with a glass of wine from its award-winning 135,000-bottle cellar. The chic Crystal Tavern, known for its golf course views and weekly entertainment, serves pub and steakhouse dishes. Diners can opt for either outdoor or indoor seating while enjoying Northern Italian dishes at the Springs Bistro.